Citrouille [Official Site] sees a pair of witches set out on a quest for candy and they soon run into a pair of bad witches that have decided to steal away all the candy in the land. Naturally enough, this quest sees them progress through a variety of challenging stages where a variety of enemies seek to frustrate progress and keep the good pair of witches from their rightful haul of candy. What stands out here is the strong art direction as well as the difficult-but-not-unfair gameplay. The objective of each stage is pass over every flowerpot on the stage and to make each flower within bloom. 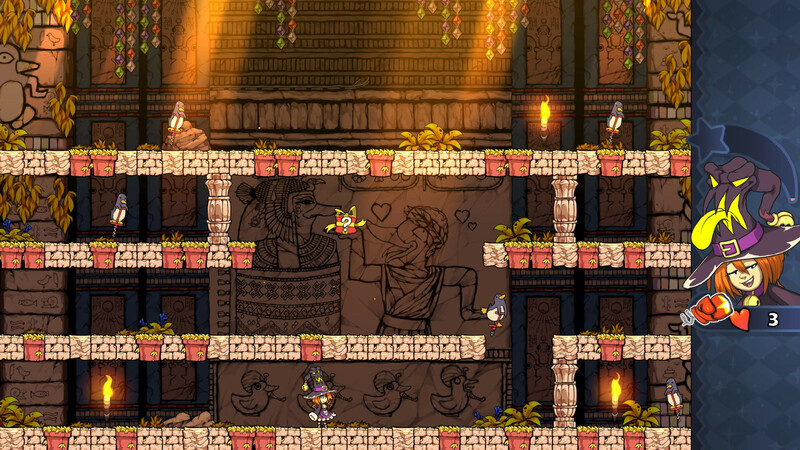 Both witches can place ladders whenever they wish on stages, facilitating navigation between platforms and enemies. Enemies will kill you with a single touch, so stunning them with a basic attack or getting an item to neutralize them to good is often necessary to survive for more than a few seconds. I appreciate how uncomplicated the controls are and while the gameplay is often frantic, it’s not hard to plan ahead or pull yourself out of a potentially deadly situation with good timing. The pace of the game is also brisk and the stages are varied in difficulty. There’s different enemy types, environmental hazards and other special obstacles that keep the basic gameplay fresh enough during a run. Mind you, it’s not really game-changing stuff between levels, but I feel that it more or less keeps true to it’s simple premise and controls while not being overly repetitive. This is a game that can theoretically be completed in a half hour, though because of how likely it is the player will be dying, it’ll probably take you longer to grasp the subtleties of the levels. That said, I felt that the game dragged a little towards the end. The final few boss stages are the most obvious example. Though, after dying countless times in the lead up to those stages, it didn’t take me too long to figure out the most efficient way of tackling the situation. While I appreciate a good challenge in my games, what I liked the most about the game was its art style and attention to detail. Every animation is smooth, the backgrounds of every stage is chock full of detail (and often gags or easter eggs) and even the enemies are kind of cute and endearing. Sure, it might not be fun to be laughed at by a hungry lizard that just ran into you but any game that has penguins on pogo sticks is alright by me. If I had to nitpick I’d say that the enemy design isn’t really thematically consistent with the stages they appear on for the most part but that’s a minor sin in a game where your witch’s hat either slurps up your enemies or pecks at them because it's a (magical?) chicken. It’s also possible to play the game cooperatively or in a multiplayer versus mode though I didn’t really get much of a chance to play the latter. It’s rather fun to play in coop mode, though it can be somewhat more difficult than singleplayer due to the fact that both players share the life same counter. If your coop partner is more careless than you, then you might be in for some trouble. The various gamepads I tried seemed to all work well and I didn’t run into any technical issues either. Not surprising, given that I was told that the game’s designer works exclusively on Linux. 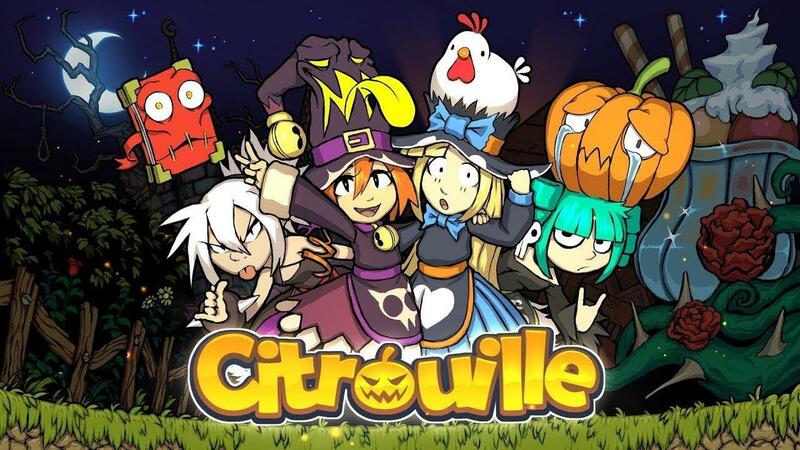 I had a lot of fun with Citrouille and would recommend it to anyone looking for a challenging platforming experience that they can pick up and play whenever. The game is fairly short and its length mostly depends on your skill level—I cleared it in about three hours but with the skills I picked up along the way, I could probably finish it in under an hour now. It’s a cute and satisfying game and, though I’m clearly a fan of witches and candy in general, I think Citrouille is worth checking out if you want something thematically appropriate to play this Halloween. You can get Citrouille on itch.io or Steam. Glad to see more of this type of game. Lost many hours in mah yoof to the likes of Bubble Bobble, Rodland, the original Mario Bros. etc.